The haunting shoreline of Crosby is never more atmospheric than in Winter along with the saltwater and driving rain it has created quite an impression on the landscape. 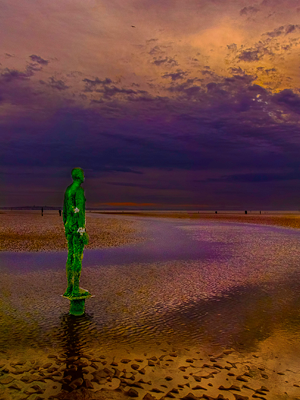 Once Gormley’s Statues are placed in the sand to add another layer to the already forbidding scene it becomes altogether Another Place. In this image i have sought to represent the otherworldly nature of what after all is quite a prosaic activity, a walk by the seaside. On the day of the shoot the weather was not co-operating at all grey skies and the threat of rain were ever present this shot was taken quite late in the day just as the sun was about to sink behind a heavy layer of clouds. However what caught my attention was the way the sky was reflected in the wet sand and how the setting sun threw a long shadow down the frame leading the eye into Gormley’s art, the eye then follows the scene guided by the ribbon of water until you arrive at the forbidding skyline which serves to break the dividing line between land and sky. Although we talk about the ‘rule of thirds’ a lot in composition I feel that breaking this scene into fourths, one forth the foreground sand with the shadow the second containing the statue and reflected sky the third dominating the horizon with dark clouds and the remaining forth the setting sun adds a far more interesting dynamic to the scene.